Dancing with the Stars’ Derek Hough and K-Pop star BoA are the driving force in this Romeo and Juliet inspired dance flick. There isn’t really much to critique with this film, it has an audience that it’s meant to please, and it does it’s job properly. Pointing out flaws and nitpicks for a movie like this in my eyes is ridiculous. ‘Make Your Move’ is for young adults, most likely female, who enjoy watching people dance and fall in love. It’s a basic formula that doesn’t take much to understand and for that I think it’s a harmless film. 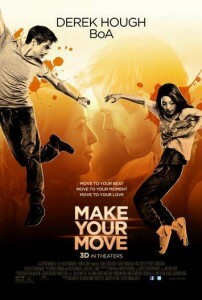 For those interested in checking out ‘Make Your Move’ it will be available on DVD and Blu-ray July 22nd! I’m sure a lot of you know about the Website/YouTube channel WatchMojo. There’s a list that you can vote on for the Top 10 YouTube Movie Critics. If this list get’s enough votes WatchMojo will consider making it a video for their channel. Yours truly is on the list (Somehwere around 83 or something) If you guys could vote for me that would be totally amazing! It’s a long shot, but I would like to see how high my ranking can get.